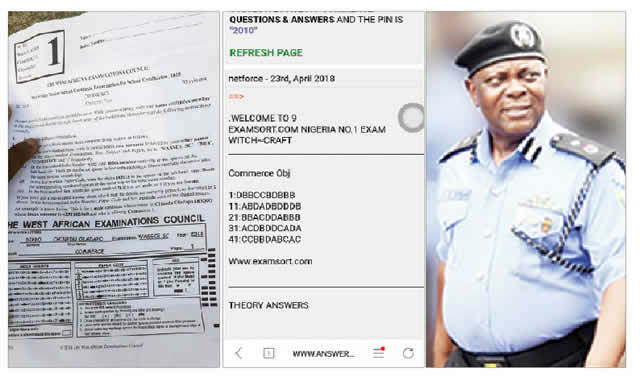 Lagos State Police Command is set to investigate leaked West African Senior School Certificate Examination (WASSCE) papers. The Lagos State Police Command has launched a manhunt for some website operators who threatened to deal with a PUNCH reporter, Samson Folarin, for his report exposing examination malpractice in the ongoing West African Senior School Certificate Examination. This followed a petition from our correspondent alleging threats to his life and family which was delivered to the office of the state Commissioner of Police, Edgal Imohimi. See also: Police Arrested Pastor Operating Fake WAEC Centre. PUNCH Metro had reported about how some pupils sitting the WASSCE being administered by the West African Examination Council cheated by subscribing to answer-peddling websites. The websites, which boasted of getting questions prior to the time of the exams, advertised various rates for different subjects and urged pupils to subscribe in bulk to get discounts. Testimonials of candidates who got excellent results after using the services of the operators were displayed on the sites. Our correspondent had subscribed to five different websites for answers to the Commerce exam which was done on Tuesday. The websites are examcrown.com, examsort.com, naijaclass.com, waecexpo.com and guruslodge.com. The operators of the sites demanded that MTN recharge cards be sent to their phone numbers, which are 09069072051, 07063609771, 08167593558, 07032581573 and 08154766482. They demanded N400 for a link to the answer websites and N800 for direct SMS of the answers to candidates’ phones. While examcrown and examsort later resorted to Internet bulk SMS, using their codenames, EXAMCROWN and EXAMSORT, to update our correspondent, others used telephone numbers, including 08101038699 and 07068088239. True to their words, the websites delivered answers to both the objective and theory questions through text messages and their portals. Shortly after the findings of PUNCH Metro were published on Wednesday, one of the website operators threatened to deal with our correspondent for writing the report. You have done your part. Nice investigation. Now, its (sic) my turn to do my thing. Mind people you step into (sic)… you are in Nigeria, not USA. Expect us. Thank you,” the message, sent by one CRACK MIND, said. Our correspondent, in the petition addressed to the CP, called for the arrest and prosecution of the suspect and his collaborators. The petition read in part, “On Wednesday, April 25, 2018, around 1pm, I received a threat text message on my phone from a sender coded as CRACK MIND. “I believe this message came from a syndicate running websites where answers to the ongoing West African Senior School Certificate Examination are displayed for pupils to copy from. The petition was approved by the Commissioner of Police on Thursday, who ordered that it be referred to the Special Investigations Bureau. Our correspondent was further asked to make a statement at the SIB, as the police promised to get to the roots of the case. The state Police Public Relations Officer, SP Chike Oti, said investigation had commenced into the case. He noted that it was wrong for anyone to intimidate journalists in the performance of their lawful duties. “The command has commenced investigation into the case. Our investigation is directed at unravelling those behind the dubious websites with the aim of arresting and prosecuting them. “The CP has ordered crack detectives and the command’s undercover officers to go after them. They may run, but they can not hide,” he added.